Is California Probate Necessary When There is Already a Trust? When is a Probate Necessary? There are many times when an estate may still need to go through probate. So when is probate necessary? Even if theirs a will or trust already this is often the result of an ambiguous or incomplete estate planning. Such as a will or trust that wasn’t update at all to reflect the changes of the decedent. This is due to unclear writing in the will or trust. In these few examples, show probate necessary for the estate. Assets were never put in the trust. It is possible to create an estate plan that appoints beneficiaries without transferring property or accounts into that trust. Assets were taken out of the trust. If an asset was removed from a trust to sell or designate a different beneficiary, it might be in the decedent’s name and never transferred back into the trust. Accounts are taken without transferring the trust. Even with an estate plan, if an account is secure and a new one is open in the name of the decedent instead of the beneficiary, then the account will need to go into probate. For instance, in order to refinance your mortgage, the lender tells you that the house must be in your name. So you transfer the house out of the trust. The house will go into probate if the house is never taken back, even after the refinance is complete. There are some circumstances at the conclusion of probate, the court decides that the house needs to have an administer. 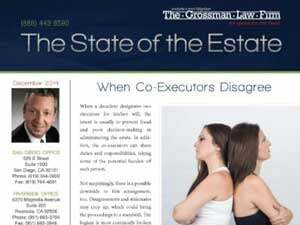 Are you the administrator or executor for a trust with unexpected complications? San Diego probate attorney Scott Grossman serves estate planning, will contests, trust litigation, probate, and trust administration to clients in San Diego and outlying areas. 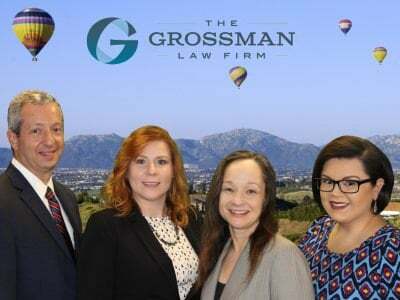 For a free case review with the Grossman Law Firm, contact our offices or through the online form. 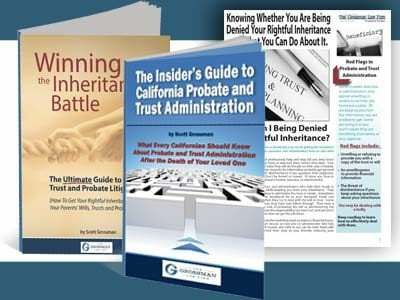 Be sure to request a FREE copy of Scott Grossman’s book The Insider’s Guide to California Probate and Trust Administration.